You are here: Home / Diary / Christmas in… September? We kitties are famous for our catnaps, but when I woke up yesterday afternoon, I really thought I had overslept! In front of me was a box full of festive Christmas cat stuff! Then I saw a note in the middle of all of these items, from PETCO’s PR firm. 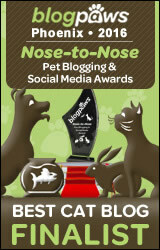 They were sending out the goodies they didn’t get a chance to hand out at BlogPaws. So I got a stocking, an Advent Calendar with lots of cat toys, and some mousie elves. Cool! Oh, and some Comfort Zone with Feliway, because you know how stressful the holidays can be! My human put the tie on Binga, thinking a tailored look would suit her better. Here she is, pretending to be Marlene Dietrich. I was really hoping to get out of modeling this cape, but no luck. So I guess I should thank PETCO and their PR firm for the early Christmas surprise. Or most of it. 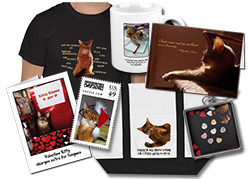 Oh, so cool cat Christmas presents! Love the slips/collar on Binga! And you look cute in that cape. Don’t be so modest! What great Christmas stuff, and it is always good to be prepared early. Especially if your mom wants to get a nice photo of you in your costumes, that might take weeks of practising. Thanks for enjoying yesterdays photo, we thought it was hilarious and one of this years favorites. What cool stuff. I’m sorry you got stuck modeling the cape, but it did look good on you. Oh, what festive Christmas attire you and Binga have! It’s good to get ready early, I think. Oh you poor darling–when I saw the clothing, I flinched. Ouch. I mean, yes, you DO look sort of adorable, but really, what are they thinking? It’s like gilding the lily. All that Christmas stuff made Sammy wonder when his tree is going up. He LOVES that thing. What a great gift! We think Binga looks very good in her sultry tailored look. You look good in the cape, but not very happy!! Any month is a good month for Christmouse! Your mom-person isn’t going to box those toys up again and make you wait, is she? Sorry you had to endure the modeling bit Sparkle. Both you and Binga look great tho! Lucky kittehz! You two look so festive we’re singing holiday songs ofur here. We aren’t quite sure if you’re gratitude is completely geninue. BTW I understand…we don’t like modeling either. You look pretty in the Christmas cape! And I think that toy-filled Advent calendar is very cool. Oh No you didn’t have to wear that cape Sparkle. Oh dear. But actually, you look pretty good in it. Good girl for wearing it. This is giving the Mom some bad ideas. Now she is going to look for Christmas clothes for us. Yikes. Have yourselves one heck of a week end. That cape is very fetching. I like the looks of the stocking and the advent calendar too. Y’all look so festive and ready for Christmas! Hey, why isn’t my tree up yet? Oh that is oh so neat, Christmas presents in September. (All because of the weather conditions for Petco’s PR.) Hope they send you something again for Christmas!!!!! Wouldn’t you prefer the cape? Beautiful Binga looks terrific in the tie & collar but in my opinion the tie and collar is more of a male thing. Sparkle, you are also such a beautiful lady to be wearing men’s stuff. How fun to have Christmas in September! But where’s the wrapping paper? Binga is absolutely adorable in that tie! Sparkle, you look very elegant in your cape! Wow! Cool stuff. But that cape… oh my. What an excellent surprised! Cool! It really is Christmas over there! Slash wants the tie and I want the cape! Mommy can have Comfort Zone since she’s the one who is always stressed out. Those are great gifts and we think the outfits are lovely!! Pawsome! What a great surprise package! And you both look great in your Christmas wear. Woooohooooo… Christmas. I’m looking around and don’t see a tree…. You both look beautiful but we understand the displeasure! What we have to go through to get goodies?!?! Perhaps you can trade the cape for Binga’s collar and tie Sparkle. Those are some nice things,Sparkle…but we’re not ready to see Christmas stuff yet!! Binga does look kinda cute in that tie, though. You aren’t feeling that cape, we can see! Love your Christmas dos sweetie – but did you have to remind us that it’s coming. M is hiding her eyes. If I was napping and I woke up to a box of goodies like that, I’d think I was still dreaming!! It is always exciting to get a package, but a surprise package is even better. Binga looks cute in the collar and tie. We can see you are not amused with your cape. Lucky you, and how very gracious of Petco. I would definitely take that as a sign of more good things to come. A bit early but a present package is welcoming any time of the year. Love the collar and tie on Binga. You don’t look too happy modelling the cape. Neither would I.